Domino is feel rather 'rusty' at the moment. She has adjusted her mood according to the colour of the fallen leaves. Here she is wearing a rust-coloured straw wide-brimmed hat adorned with an ivory ribbon flourish. Her jewellery is fashioned in pink gold and studded with orange citrine gems; both her necklace and coordinating bracelet. Domino's purse is another funky choice with a tan leather top and handles, and an orange-scalloped base. It helps to tie the outfit nicely together. "Who noo dat bein' rusty in fashion wood turn out ta be a PAWSitive?" asks she. And, like the leaves, themselves, Domino is efur-changing! I just can't wait to see what she chooses next time. 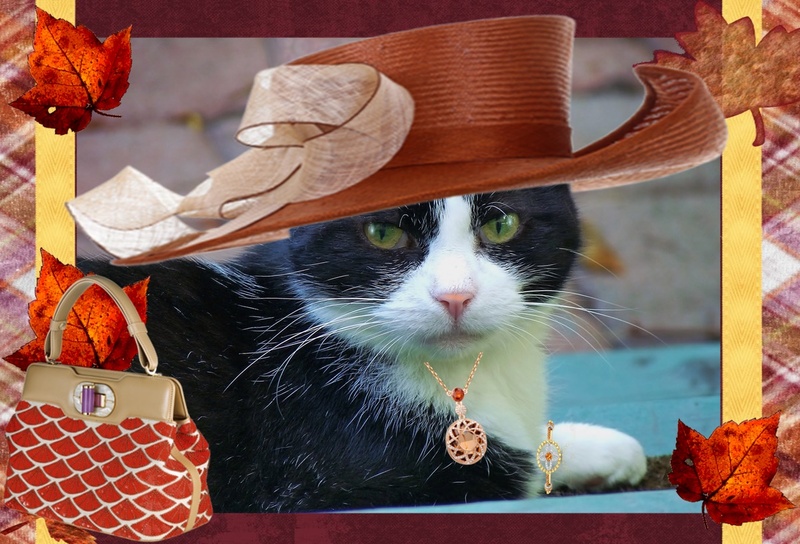 You're darn hat fancy sweet Domino and I love your necklace! You have the best taste Domino. You are gorgeous too.